• Does Bush Still Have a Shot at the Nomination? • Does the Republican Establishment Actually Want to Win? The corn-fed people of Iowa had their chance to shine last week, and now the residents of the Granite State will get their opportunity. One side of the contest should be fairly anti-climactic, while the other side will be drama galore. Let's start with the anti-climactic side first. Sen. Bernie Sanders (I-VT) is going to win the Democratic vote; the only question is by how much. Outside of a few outliers, most polls taken in February have had him up between 10 and 20 points. If he wins by, say, 15 points (57-42), then he will take 14 delegates to Hillary Clinton's 10. Not a major difference when it requires 2,383 to win the nomination, but it will allow him to claim a victory and momentum going into the next Democratic debate on Thursday and into the Nevada caucuses on Feb. 20. Obviously, those are both short-term impacts. The biggest long-term impact of a Sanders win, particularly if it's a big one (say, 20 points or more), could be heads rolling at Clinton campaign headquarters, since she has already acknowledged that a "shakeup" is under strong consideration. Will people be more likely to vote for Donald Trump when they don't have to share that information with their friends? What impact will the weather have? There is presently a blizzard underway in New England, and it is expected to be cold, windy, and snowy through the day on Tuesday. This should depress overall turnout, potentially setting the stage for anomalous results, and will specifically depress rural turnout, which could hurt Sen. Ted Cruz (R-TX). How will the late deciders break? New Hampshirites are notoriously flexible about the preferences until the last minute, with roughly 40% this year saying they have not yet settled on a candidate. New Hampshire also allows independent voters, of which there are many, to vote for either party. So, some voters may be focused on which candidate they like best, while others may be deciding which candidate represents the best strategic choice. In particular, given the lack of drama on the Democratic side, a lot of centrist or left-leaning independents may choose a Republican ballot in hopes of derailing Ted Cruz or Donald Trump. The New York Times has a good overview, including interviews with voters who have narrowed it down to some very unorthodox pairings, like "Sanders or Bush?" or "Christie or Clinton?" We are taking our message to families that are struggling to raise their children in the 21st Century, because as you saw, Jeanette and I are raising our four children in the 21st Century. And we know how hard it's become to instill our values in our kids instead of the values they try to ram down our throats. In the 21st Century, it's become harder than ever to instill in your children the values they teach in our homes and in our church, instead of the values that they try to ram down our throats in the movies, in music and in popular culture. The video can be seen here; it looks and sounds even worse than it reads. Rubio literally could have spent weeks searching for a better way to confirm the RubioGlitch meme, and he could not have done better. We should know in 24 hours whether it will hurt him with voters. Donald Trump has an excellent chance to right the ship on Tuesday. He's dominating in the polls, New Hampshire voters like a little rebelliousness (the state motto is "Live Free or Die," after all), and—as noted above—the "Trump Effect" (it's not socially acceptable to admit support for The Donald) should not cost him votes, as it may have in Iowa. Further, there is a quirk in the system that could play right into his hands. By RNC rules, New Hampshire (like any state that goes before March 15) must award its delegates proportionally. However, only a candidate who clears 10% of the vote in New Hampshire receives delegates; anyone who comes in at less than 10% has their votes/delegates awarded to the overall winner. If Trump receives 30% of the vote, that would entitle him to 6 delegates. If, say, Jeb Bush and and Gov. Chris Christie (R-NJ) each take 9%, and Carly Fiorina and Ben Carson each take 4%, then the Donald would add another 26% of the vote and another 5 delegates to his total, nearly doubling his tally. And for the next few weeks (or months), he would be sure to point out very regularly that the Granite State has an excellent track record at predicting the nominee, having voted in favor of the ultimate GOP candidate in 10 of the last 12 elections. Marco Rubio has a lot on the line on Tuesday. If he can manage the nice, clean second place finish that seemed inevitable just last week, then the RubioGlitches should be a mere hiccup, and he can proceed with his 3-2-1 strategy (third in Iowa, second in New Hampshire, first in South Carolina). But the worse he does, the more trouble he is in. In part, this is because it will fuel the narrative that he's not presidential and that voters are losing confidence in his candidacy. And in part it is because most of the support he bleeds will go to the other "establishment" candidates, whom he badly needs to knock out. A third-place finish, if Ted Cruz takes second, may be survivable, though it's worth noting that no Republican in a century has finished worse than second in New Hampshire and gone on to claim the GOP nomination. If Rubio finishes third behind Gov. John Kasich (R-OH), or he drops to fourth or fifth, he is going to be in real trouble. John Kasich, being non-dogmatic as he is, is the kind of Republican that New Hampshirites tend to like. More than one poll of the state has put him in second place behind Trump, and this was before Rubio's stumbles. It is entirely possible that many of the strategic voters decide he's the wisest investment of their vote, and if he finishes in second, he could quickly gain traction as the establishment's candidate of choice. This is even more true if Rubio is not the person in third place. Not too long ago, Tuesday seemed like it would be the end of the road for for the Ohio Governor. Now, he's almost certainly going to get enough good news that he'll hang around for a bit longer. And maybe a lot longer. For what it's worth, the first-to-vote town of Dixville Notch, which traditionally opens the polls for its 12 residents at 12:01 a.m., gave Kasich a 3-2 "victory" over Donald Trump (with 4 Democrats voting for Bernie Sanders, and 3 voters deciding they preferred to stay in bed). Ted Cruz is not likely to have a good day on Tuesday. Most polls put him fourth or fifth, and again, this is before we consider the impact of Marco Rubio's changing fortunes and of the poor weather. A finish outside the top three is very possible, and is, in fact, rather probable, since Kasich and Bush (and maybe Christie) are likely to surge at Rubio's expense. A finish outside the top three would feed, very correctly, into the narrative that Cruz is a one-trick pony who can't win in states where the GOP is not dominated by evangelicals. Which, unfortunately for him, is most of them. Jeb Bush is on the upswing right now (see below), and has been living in the fuzzy 2-3-4-5 range in the New Hampshire polls with Rubio, Cruz, and Kasich. A fairly small bump, maybe two or three GOP voters out of 100, could put him in the top three. And like Kasich, New Hampshire no longer seems likely to be the end of the line for him—there will be enough good news on Tuesday to justify soldiering on to his home state of Florida on March 15, at the very least. Chris Christie has not made much of a dent in polls of the Granite State, consistently finishing in the 5-6% range, and never once cracking the 10% needed to claim delegates. But, of course, he was the one who cut Marco Rubio off at the knees. Some GOP voters may like what they saw, and with the field this divided, it doesn't take much to move up the list. Certainly, of the three governors, he is in the most tenuous spot, and the most likely to throw in the towel on Wednesday. But optimism on his part is not crazy at this point, and while he's essentially out of money, he too could like what he sees on Tuesday well enough to hang around a bit longer. Particularly if, by some stroke of fate, he vaults into the top three. Ben Carson has no clear base of support in New Hampshire, and Carly Fiorina has no clear base of support anywhere. They are going to finish far out of the running, and are going to see their votes go to Donald Trump. This should tell them that not only has the fat lady sung, she's taken off her metal brassiere, showered, gone home, and gone to sleep for the night. However, neither of them has been particularly willing to see the writing on the wall, and so there's no obvious reason to think that they will on Tuesday. New Hampshire Republicans tried and failed to end same-day election registration and to prevent college students from voting in the city where they go to school, but they did manage to pass a controversial election law anyway. Under the new law, voters will be asked to show government-issued photo ID to vote. If they don't have it, they can sign an affidavit stating that they are eligible to vote, but poll workers will be required to take a photo of them and attach it to the affidavit. The real intention is to make the photo like a police mug shot to intimidate voters. The message is "we think you are a criminal." The practical effect of the law is to make the voting process slower, resulting in longer lines and more people giving up and going home without voting. In well-off areas, where almost everyone has a driver's license or passport, there won't be any problems, but in poorer areas, where many people lack the proper ID, it will be a major disincentive to voting, which, of course, is why the law was passed. Supporters say it is needed to combat voting fraud, but actual cases of in-person voting fraud are virtually nonexistent. New Hampshire is but one of 16 states with new, restrictive voting laws. What makes the real purpose of these laws obvious is that all of them were passed in states where Republicans control the state legislature. No state run by Democrats has passed such a law. 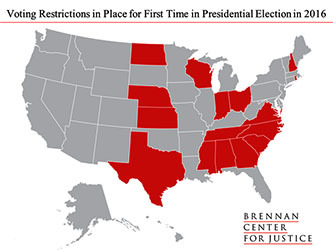 Here is a map showing the states (in red) that have passed the new restrictive voting laws. Does Bush Still Have a Shot at the Nomination? Only a week or so after the Republican establishment tentatively began annointing Marco Rubio as the Cruz + Trump (Crump?) slayer, Rubio blew it in Saturday's debate. If he does poorly in today's New Hampshire primary, where does the establishment find a new savior? Kasich is completely sane, has 18 years of experience in Congress, and was twice elected governor of the second-most-important swing state. If the Democrats had someone like this, he would be a leading contender, but in the Republican Party he is a pariah for worrying more about what St. Peter will think of him some day than what the Republican base thinks of him right now. Chris Christie has an abrasive personality but no cash and no organization on the ground in the states beyond New Hampshire. So this is where Bush pops up again. He hasn't run a very good campaign, but he is improving, everyone in the country knows who he is, and he has plenty of money left and the potential to raise a lot more if he starts winning primaries. Donald Trump's slogan "Make America Great Again" has clearly struck a chord with blue-collar workers who are threatened by stagnating wages, jobs being shipped overseas, and power shifts away from white men and toward women and minorities. The only problem with his program is that none of it, such as deporting 11 million people or building a fence 1,954 miles long, most of it on private property that would have to be taken by eminent domain, (a process Republicans hate), is feasible. Economists have looked at the plight of the blue-collar workers and come up with some ideas that could actually help them, but none of them are Trump's. Let's start with immigration. Rounding up and deporting 11 million people would shrink the labor force (and the economy), not to mention being socially divisive and requiring something close to a police state to accomplish. Providing the undocumented immigrants a path to citizenship would actually increase wages for blue-collar workers, since they are presently competing with easily exploitable workers who can't complain if they were ripped off and who certainly can't unionize. If the undocumented immigrants were citizens, they could demand better wages and that would help people competing with them. A second area that could help workers is looking at trade agreements much more carefully. They clearly benefit companies that can produce products more cheaply in China or Mexico, but jobs are lost in the process. One way to deal with this would be punish trading partners that manipulate their currencies, ban unions, subsidize local companies, or have lax labor or environmental regulations. The obvious punishment is a tariff on their goods. Also in this line of thinking is to provide displaced workers with relocation vouchers so they could move somewhere where there are jobs. Does the Republican Establishment Actually Want to Win? This is a man who has changed parties five times, been married three, had businesses go bankrupt four times and has openly speculated about dating his own daughter. For policy prep he says he watches all the shows, perhaps mostly cartoons, as he is unaware of even a high school level of public policy. Nuclear triad? What's that, a Chinese gang with really good weapons?